If you could soundtrack the jangle of the sea and the jazz of the surf, the Mattson 2 would most certainly be the composers. The foot stomps of a shoe-gazed salty air meets the tight groove and polished shake of the night with each of the duo’s multi-layered tracks. And with their third record, “Feeling Hands” (Galaxia records. Produced by Thomas Campbell), audiences around the globe are witnessing the growth of two musicians hitting full stride with deft layering, detailed composition and an altogether unmistakable sound. 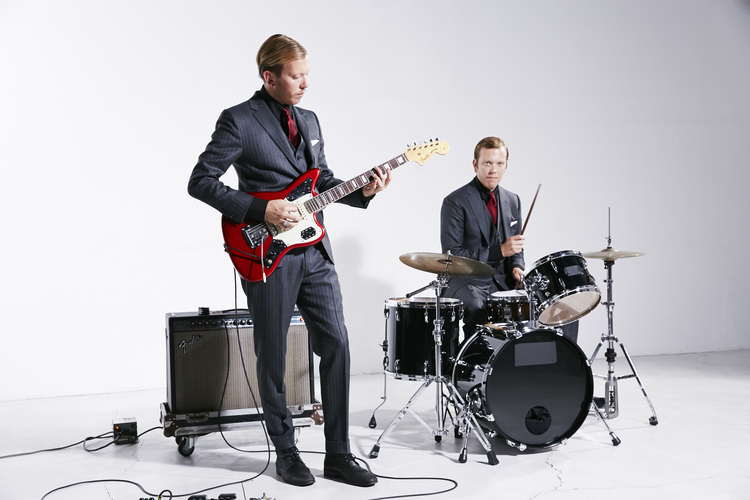 With their signature suits in tow, both Jared and Jonathan have relentlessly toured throughout Brazil, Paris, Spain, Japan, Denmark, Finland, The Netherlands, and the United States, generating global acclaim while also further curating their sound into a musical kaleidoscope that brings to mind everyone from Charles Mingus and Chet Baker to the Smiths and the Jesus and Mary Chain. They have acquired a pair of Bachelor’s degrees in music with an emphasis in Jazz and African studies from the University of California San Diego, and even more recently received their Masters of Fine Arts degrees in Music from University of California Irvine. At UC Irvine, they were a part of the Integrated Composition, Improvisation, and Technology program (ICIT). Having performed with the likes of Ray Barbee, Tommy Guerrero, Money Mark, John McEntire, Edward Sharpe and the Magnetic Zeros, Cornelius, Farmer Dave Scher, Dave Pike, Jeff Parker, Mark Dresser, Nicole Mitchell, Anthony Davis, and George Lewis, the Mattson 2 have grown up quick, accomplishing more in a short time than many musicians in their entire career, and thus further providing a mature sound that is equally at home on the beach as it is in the jazz club. So tighten that tie, turn up the volume, dig your toes in the sand and soak in the shimmery whitewash of the Mattson 2.